There’s something beautiful about Shakespeare’s work but there’s something even more striking about his plays when they are set on nature’s stage. Mayhem Musical Theatre Company really brought some originality to As You Like It with a strong cast and a gorgeous setting for one of the Bard’s classics. As You Like It follows leading lady Rosalind who disguises herself as a man and runs away to the Forest of Arden with her cousin Celia to find her exiled father. Orlando, who also finds himself in the forest, leaves romantic notes for Rosalind. Through her disguise she manages to teach him a lesson in love, while at the same time encountering some strange, smitten characters in the forest in this classic romantic comedy. The location was perfect for a pastoral play, matching the attractive setting of the Forest of Arden. The grounds of St Philomena’s School were lovely although from where I was sitting it was slightly distracting to see other people and cars passing through occasionally. I loved how the company were always ‘on stage’; the scenes blended together naturally and it was clever to see some of the players continue to act their part outside of their scripted lines. Orlando for example continued to place his love notes on trees in the background, which was a nice touch to his character. The only thing I felt could be tweaked with this was the position of the musicians. They played beautifully but were quite quiet as they stayed with the resting cast set back from the main action. It would have been nice to bring them forward to make more of them in their scenes. I have never experienced an outdoor play before and I enjoyed my experience immensely although volume was an issue at some points. The majority of the cast had their projection perfected but just a few players needed to remember their surroundings, especially when set at an angle with backs facing some audience members. Only a few lines were lost for me so didn’t affect the production drastically and I can understand how difficult it is, especially with the modern transport competing at times! I was delighted to see such a strong cast in this production, steered brilliantly by the two leads, Ashley Jones as Orlando and Jodie Ellis as Rosalind. Ashley is clearly a natural Shakespearean actor – a strong and authoritative performer, portraying a faintly arrogant Orlando which I liked, but also touching on his tender side when appropriate. I loved the opening scene with his brother Oliver (strongly played by another natural Ricky Zalman), immediately displaying his powerful character. Jodie impressively commanded her role, playing an intelligent Rosalind. She also worked well alongside Maia Gibbons who gave a confident and enjoyable performance as Celia. I have to mention Martin Scorer as Jacques who pulled out all the stops with the famous ‘all the world’s a stage’ monologue. As one of my favourite scenes I was willing him to play it to my taste and I wasn’t disappointed. It was thoughtful and funny and included a little audience interaction which was a brilliant touch. Mayhem have brought together a skilled cast as a whole but I can’t finish this review without mentioning a particularly comedic goat in the form of Ipek Uzman – a perfect example of bringing a small part to life and a refreshing spin on Shakespeare’s comedy. I would highly recommend this entertaining and thoughtful production of As You Like It. You are presented with a first-rate piece of Shakespeare in a wonderful setting which, coupled with some slight tweaks to a sometimes unclear plot, brought a nice originality and new understanding to this classic play. 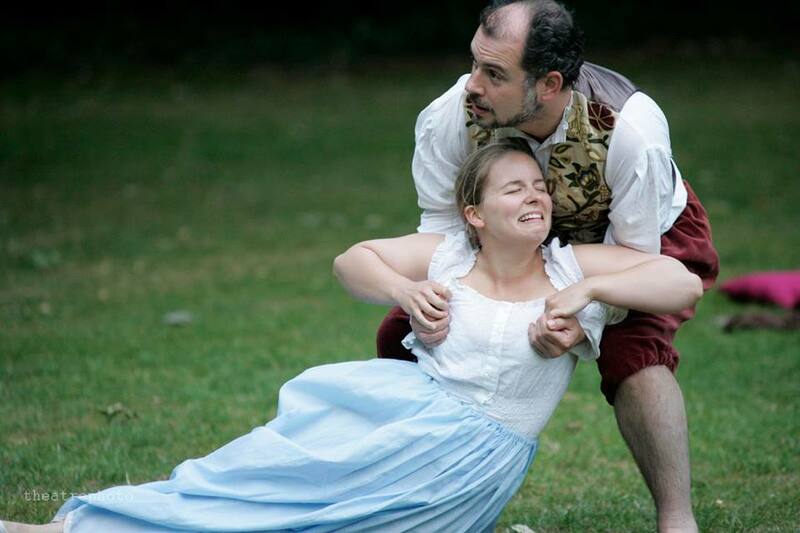 As You Like It runs in various locations in South London until Saturday 18th July with tickets still available online. With thanks to Sardines Magazine for press tickets. Original review available to read on their website here.